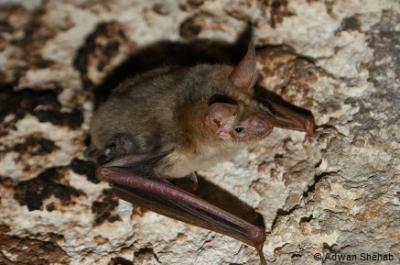 With a wingspan of 350 - 430 mm, the Greater Mouse-eared bat is the largest Myotis. Both its snout and ears are long and broad, and its short and dense fur is a blend of brown and grey colours. This species prefers deciduous and mixed woodlands, though it can also be spotted hunting over pastures and meadows. M. myotis is a cave-dwelling species and during winter, it tends to roost in caves, mines and cellars. Other roosts used by this species include the roofs of buildings and abutments of large bridges. M. myotis maternity colonies can reach 2 000 individuals and often have clusters. The Greater Mouse-eared bat uses both echolocation and its well developed sense of smell and hearing to catch its ground-dwelling prey: ground beetles, spiders, beetle larvae and grasshoppers. 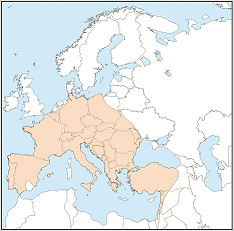 M. myotis is a regional migrant, whose movements between traditional summer and winter roosts usually range from 50 to 100 km. Stable according to the IUCN Red List. This species occurs in western, central and southern Europe, as well as in Asia Minor. It appears to be absent from the islands of Corsica and Malta, and from Northern Africa. Threats to this species include cave tourism, building renovation, increasing habitat fragmentation and use of pesticides.